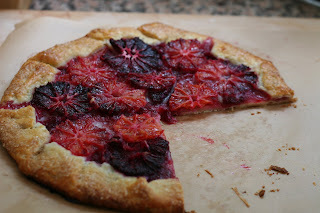 The very instant I saw this blood orange tart on Smitten Kitchen earlier this year, it was love at first sight. The vivid colors of the oranges peered over a buttery crust and I knew immediately that I had to make this. You see, my parents have a blood orange tree in their front yard, and they’ve already got the jam and sorbet thing down pat, which leaves me little to do with the fruit. 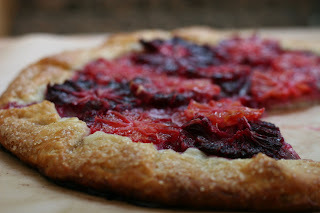 Or so I thought until I baked up one of these gorgeous galettes. I guess it never occurred to me to actually bake something with oranges in it. Sure, the zest is great in pie crust or cookies. The juice could be cooked into a simple syrup and poured over a loaf cake. But to actually bake something that featured actual oranges in it? Oddly enough, about two weeks after I’d spied Smitten Kitchen’s beautiful Blood Orange Tart, J came home with a small sliver of an orange tart he’d tried at the Little Flower Candy Company and loved so much that he saved a piece for me to taste and try to recreate. It looked very similar to the Smitten Kitchen version, and when my parents brought over a large bag of oranges a few weeks later, I knew I had to try it. 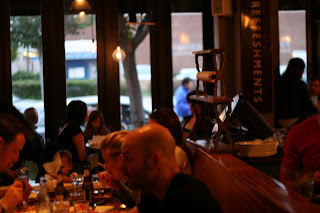 Since I’d had such fabulous luck with Smitten Kitchen’s (no, I’m not her stalker, I just like the site ok?!?!) 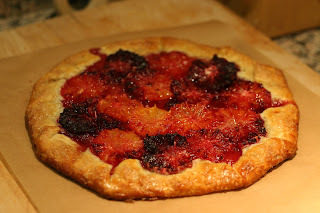 galette dough, I decided to ditch the all butter pastry and make a sweet version of that. I basically added about ½ cup of powdered sugar to the savory dough recipe. As with the previous ten or so times I’ve made this dough, it was a dream to handle and rolled out easily with no tearing or fuss. It’s truly the easiest and most successful dough recipe I’ve ever used and I’ll probably continue to use it for anything that calls for a pie dough in the future. After rolling the dough out into a circle, I just put the segmented oranges in the middle, sprinkled that with some sugar and then dotted it with a tablespoon of butter. 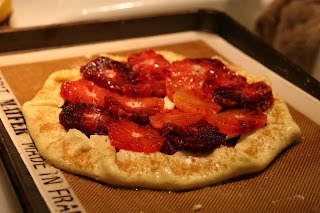 After crimping in the sides, brushing them with egg wash and sprinkling that with some turbinado sugar for texture, I layered the top of the galette with sliced blood oranges. I loved how each orange differed in color which makes each galette unique. As you can see, it’s a real stunner and is great for dessert or breakfast. I’m a little embarrassed to admit it, but J and I managed to polish off an entire one over the course of a weekend, sneaking slices here and there and eating it like pizza. 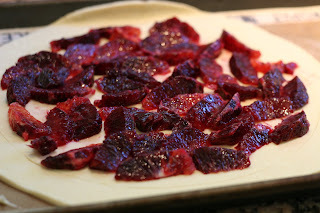 I made another one that same weekend but gave it to my parents to thank them for the blood oranges, and also so J and I wouldn’t go bonkers and eat a second one (we’re not total gluttons, after all!). J exclaimed this to be “the best dessert you’ve ever made!” I guess the mix of oranges, butter, sugar and flaky dough is pretty addictive. 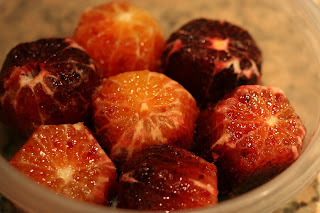 If you have a bag of blood oranges (or any oranges, really!) laying around, I highly recommend you give this a try. As most of you already know, I absolutely adore Italian food. I always tell people I could live on sushi and Italian food alone (maybe toss in the occasional Sun Chip now and then), and although I’m not 100% certain of that statement, I do find that I never tire of either. 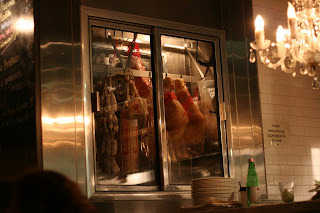 A few months back, a friend introduced me to the pure pleasure that is Terroni’s. I fell in love with the place immediately, being transported to a bustling Italian café the minute I walked in. 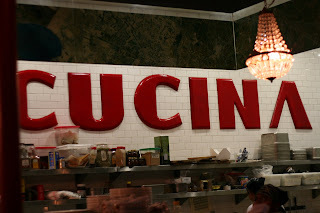 A giant, red sign that reads “CUCINA” overlooks the entire restaurant and the Charming Italian Owner Lady (I don’t know her name so that’s what I call her!) makes you feel right at home. I mean, you’re already in love, right, and you haven’t even heard about the food! Oh, the food………..let me count the ways I love thee………..
Ok, so I’ve yet to try everything on the menu, but seeing as they have no less than 13 pastas and even a larger variety of pizzas, plus their daily meat, poultry and fish specials AND a wonderful selection of appetizers and salads, you can see why. Maybe I’ll take a vacation from work for one week just so I can eat every single thing on the menu. People will say, “Where’d you go for vacation?” and I will say “Terroni’s.” Hmm, at first I was joking but it doesn’t sound like a bad idea. I could just tell everyone that I went to Italy, because I feel like I do every time I’m there. Ahhh….gush. Last week J and I took my sister C, who had never been. She, too, has a fondess for Italian food and after listening to us hem and haw about the place she was happy to finally experience the joy herself. Even though we got there early (6:30 PM on a Sunday) the place was packed as usual (Terroni’s doesn’t take reservations), so we took a seat at the bar and sipped prosecco until a table opened up. We got a seat right next to the pizza counter section of the open kitchen, so we could see the lovely balls of dough being tossed and turned into wonderfully thin discs and then slid into the oven. How’s that for food foreplay?? 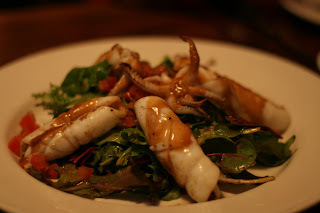 Grilled calamari salad: J's favorite so we always get this. The squid is perfectly cooked with a slighthly smokey flavor, and the balsamic vinaigrette gives the perfect, acidic balance. YUM. 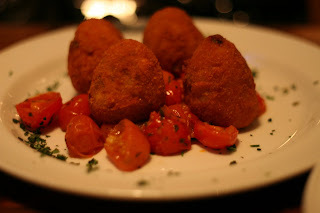 Arancini: Fried. Risotto. Cones. You really don't need to know anything else but these particular ones come on a bed of just heated-through cherry tomatoes bursting out of their skins. Heavenly. 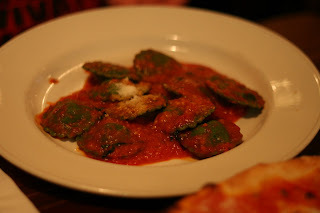 Swiss chard ravioli: J ordered these for the first time and we were all blown away at how the integrity of the chard was kept intact in the filling. When you bite into one you'll see green (just like the pasta), not a mess of white cheese. Clean, simple and utterly delicious. 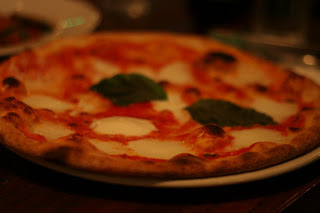 Pizza Margherita (sorry for the ultra fuzzy photo! ): C ordered this and we all had a slice. Thin and crisp in the right places, slightly chewy in the right places, you can see why this is one of their most popular items. 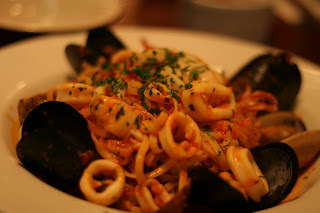 Linguine Mare: My dish was gorgeous and overflowing with fresh clams, mussels, shrimp and calamari all garnished with the lightest touch of tomato sauce and white wine. 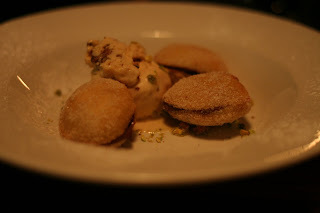 We finished the meal with these little fried donuts filled with Nutella and accompanied by an ice cream I can't really remember. When you have balls of fried dough filled with Nutella around, you pretty much become oblivious to anything else around you. I hate to sound like a commercial...it's just rare that a restaurant hits every time, even after repeated visits, on every cylinder, and Terroni's does. 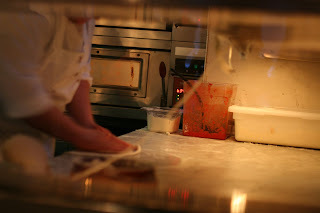 It's simple but thoughtfully prepared Italian food served by people who really seem to care. That's something to gush about, right? Hm, maybe I'll take that Terroni's vacation after all. The rest of the celebration meal…………. As you saw in my last post, we spent Saturday evening at our house celebrating both my dad’s birthday and my parents’ 37th anniversary. I love cooking for others, but particularly my family since they are some of the biggest food lovers I know. 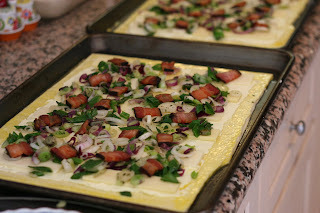 In fact, food is the focus of most of our family gatherings, and last weekend was no different. I’m happy to report that I’ve streamlined my process of cooking a meal for guests. In the past I would look furiously through almost every cookbook I own (and that’s saying A LOT considering how many I have!) trying to find the perfect appetizer, the perfect salad, the perfect everything- and by perfect I mean choosing recipes that required me to make everything from scratch- and I mean everything. I don’t know why I thought slaving all day and preparing no less than five intricate creations was the only way to achieve the Perfect Dinner Party. Luckily I’ve seen the error of my ways, and although I love cooking more than ever before, I have calmed down a bit and realized that a good dinner party doesn’t have to be so difficult. Hmm, I sound like the Barefoot Contessa, don’t I?? Look, I am never going to pull a Sandra Lee and open up a can of beans, toss in some hot dogs and call it dinner, but I’ve began to embrace the idea that buying a few pre-made items or keeping it really simple isn’t a sin. 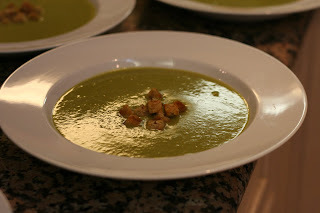 That said, I went with a simple starter of Puree of Asparagus Soup which I made one day a few weeks back when I had an extra bunch of asparagus in my refrigerator. At the time I just made it up as I went along and was quite pleased with the results. 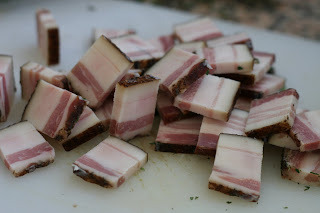 It’s honestly one of the simplest things you will ever make (I posted the recipe below) but people seem to think you spent a lot of time on it. I topped each bowl of soup with tiny croutons made with 2 slices of multigrain bread that sat forlornly in the freezer- I just diced them up (still frozen- it’s much easier to cut) and tossed them with some olive oil, salt and pepper and baked them until they were golden. 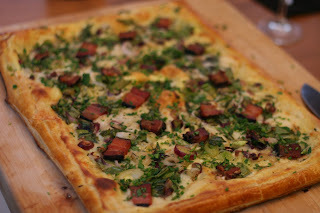 The only thing I used a recipe on was the Young Onion Tart with Cantal, Applewood-Smoked Bacon, and Herb Salad from my trusty and well-stained Sunday Suppers at Lucques Cookbook. I can’t tell you how much I adore it….it’s like the favorite child of my cookbook collection! Every dish I’ve ever made out of Suzanne Goin’s beautiful book has been outrageously delicious. I bought the puff pastry (my dad asked if I made it which made me laugh….I’m afraid that making puff pastry before a dinner party is a quick way of going stark raving mad) and layered it with a creamy mixture of ricotta, crème fraiche and egg yolk, slices of both young and cave-aged gruyere (I couldn’t find Cantal), a smattering of sautéed young onions and thick slices of smoked bacon. 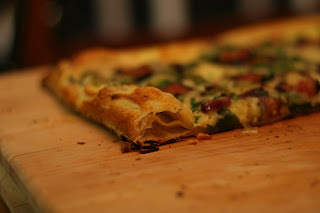 I actually used half the amount of bacon the recipe called for –sorry Michael Symon!- I love it but this tart is rich enough as it is. I did sauté the onions in the rendered bacon fat if that makes you feel any better! A nice showering of fresh tarragon, chives, chervil and parsley plus a drizzle of fresh lemon juice finished off the tart. While on an excursion to the local farmer’s market to pick up the aforementioned herbs and young onions, I spotted some gorgeous baby carrots with the stalks still attached. 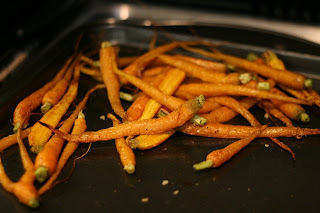 I try not to mess too much with such amazing produce, so after tossing the trimmed carrots with some good olive oil, sea salt and pepper, a quick roast in the oven was all it took to bring out their natural sweetness. 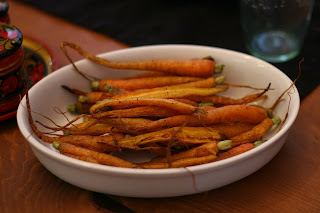 I especially loved how the slimmer parts of the carrots turned golden and crunchy. 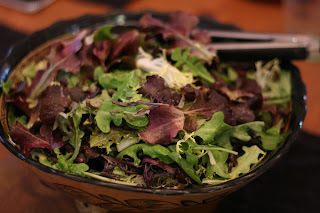 I also picked up a bag of some beautiful mixed greens which only needed a quick toss with a vinaigrette made with lemon juice, olive oil and Dijon mustard. Everything was quite easy to make, and since the tart can be assembled and the soup made completely in advance, I got to sit and sip champagne with my family before we sat down for the meal. No sweat, no running around…it was lovely! 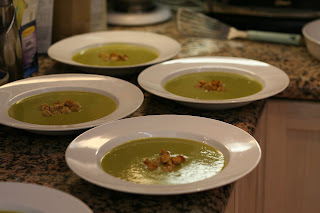 Note: I purposely leave out carrots which are usually used as aromatics because I don’t want the orange of them to taint the pure, green color of this soup. I also do not use garlic since I really wanted the flavor of the asparagus to shine through. You can certainly add both during the sautéing stage if you prefer. Heat the olive oil in a stock pot over medium heat and add the onions and celery; sauté until translucent, about 4 minutes. Add the sage leaves if you are using and heat through. Add cut asparagus and sauté about an additional 5 minutes. Add the chicken or veggie stock until it reaches about an inch above the vegetables, bring to a boil, then reduce heat and simmer for 15- 20 minutes or until everything is tender. Transfer about 1/3 of the mixture to a blender, and, holding the lid with a thick towel, very carefully blend the mixture until smooth. Transfer the puree to a large, clean mixing bowl and repeat with remaining mixture until all of it is pureed. Return entire puree to the stock pot, taste for seasoning and add salt and pepper to taste. Heat through and serve. Garnish with croutons if you like.